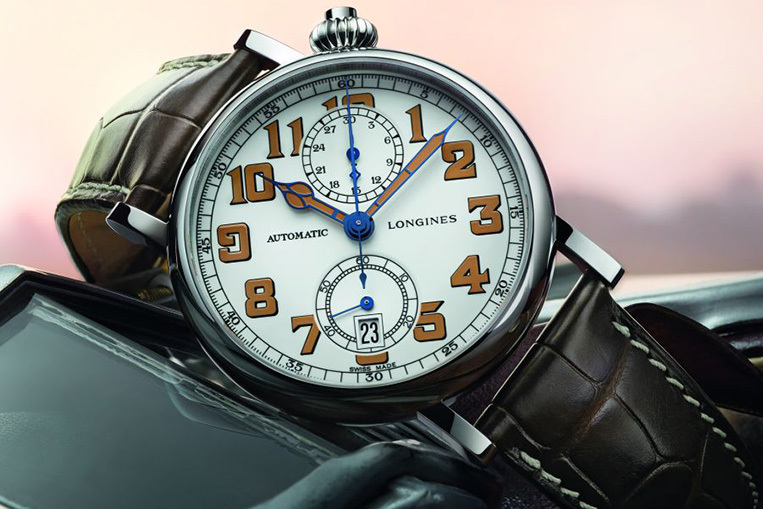 News: Longines Avigation Chronograph Type A7 1935 | Watchfinder & Co.
Longines has a long history with aviation—in the early 1930s, it even partnered with legendary pilot Charles Lindbergh to design a clear, reliable navigational watch for use while airborne. It’s only natural that the brand wants to build upon this impressive heritage—but what’s great about it is that the watch has been executed in such a nice way. The Avigation Chronograph really evokes a feeling of that pioneering era, and yet it doesn’t feel out-dated or too gimmicky. The white dial features prominent tan-coloured numerals and hands in blued steel, with a ‘train track’ minutes wheel around the periphery that is clear and well proportioned. But what’s really special about the piece is the dial’s positioning; the jaunty 40° angle to the right makes the watch the perfect companion to the pilot mid-flight, making the dial easily readable at just a glance. The case is 41mm and gives a good amount of wrist coverage while still maintaining the vintage illusion. The watch is powered by the in-house automatic calibre L788.2 (which is based on the EA A08.L11) and it features a mono-pusher column wheel chronograph. It’s a well made timepiece by a longstanding Swiss brand, and as with most Longines pieces, it offers remarkable value for money, being sold for just over £3,000 at the time of publishing.